Borrowed from Middle French canal, from Old French canal, from Latin canālis (“channel; canal”), from canālis (“canal”), from canna (“reed, cane”), from Ancient Greek κάννα (kánna, “reed”), from Akkadian 𒄀 (qanû, “reed”), from Sumerian 𒄀𒈾 (gi.na). Doublet of channel. 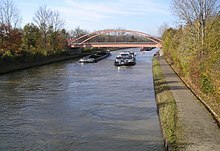 An artificial waterway or artificially improved river used for travel, shipping, or irrigation. (anatomy) A tubular channel within the body. (astronomy) One of the faint, hazy markings resembling straight lines on early telescopic images of the surface of Mars. In the mangrove-type salt marsh, the entire marsh must be canaled or impounded. Near Rotterdam we canalled by Delfthaven. From Old Occitan [Term? ], from Latin canālis (“channel; canal”). Borrowed from Latin canālis. Doublet of chenal. “canal” in le Trésor de la langue française informatisé (The Digitized Treasury of the French Language). From Old Galician and Old Portuguese canal (13th century, Cantigas de Santa Maria): cana (“cane, reed”) +‎ -al. Cognate with Spanish cañal. V casares en Cesar os quaes fforon de Mayor Aras moller de Martin Sanchez Xarpa com huum paaço et con huum canal enno Tamare. Borrowing from Latin canalis. Doublet of canle, cal. “canal” in Dicionario de Dicionarios do galego medieval, SLI - ILGA 2006-2012. “canal” in Xavier Varela Barreiro & Xavier Gómez Guinovart: Corpus Xelmírez - Corpus lingüístico da Galicia medieval. SLI / Grupo TALG / ILG, 2006-2016. “canar” in Xavier Varela Barreiro & Xavier Gómez Guinovart: Corpus Xelmírez - Corpus lingüístico da Galicia medieval. SLI / Grupo TALG / ILG, 2006-2016. “canal” in Dicionario de Dicionarios da lingua galega, SLI - ILGA 2006-2013. “canal” in Tesouro informatizado da lingua galega. Santiago: ILG. “canal” in Álvarez, Rosario (coord. ): Tesouro do léxico patrimonial galego e portugués, Santiago de Compostela: Instituto da Lingua Galega. From Old French canal, from Latin canālis (“channel; canal”). From Old Portuguese canal, from Latin canālis (“canal”), from canna (“reed, cane”), from Ancient Greek κάννα (kánna, “reed”), from Akkadian 𒄀 (qanû, “reed”), from Sumerian 𒄀𒈾 (gi.na). This form may possibly be an early borrowing or semi-learned term; cf. the fully inherited doublet cale, and related calha. Borrowed from French canal, Latin canālis. From Old Spanish canal, from Latin canālis (“channel; canal”). “canal” in Diccionario de la lengua española, Vigésima tercera edición, Real Academia Española, 2014. This page was last edited on 12 March 2019, at 05:22.